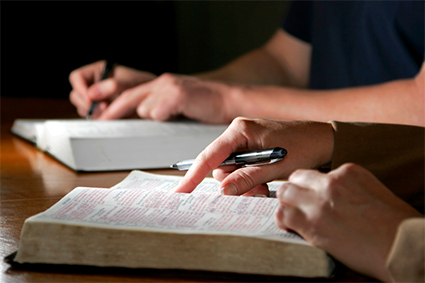 Certain portions of Scripture may appear to contradict other passages. When Bible students discover this, they often assume the Bible is untrustworthy. They reject the Bible rather than studying to resolve the conflict. When one Bible text appears to conflict with another Bible verse, it is Heaven’s invitation to study more. All facts and principles related to the subject must be brought to the study. The conclusion that does not conflict or contradict the weight of evidence, is the correct understanding. Further study will always resolve the apparent contradiction because Truth never contradicts itself. The phrase, “Let each be fully convinced in his own mind” is often used to “prove” that all are free to choose on which day, if any, they worship the Creator. People claiming to worship “every” day also use Romans 14 as their Biblical support for not observing a specific Sabbath day of worship. Such a belief is based on the assumption that Paul is speaking of Sabbaths and feast days in the quoted passage. However, a careful study of the context, and the rest of Paul’s writings, reveal the error of this idea. Paul always kept the feasts and the seventh-day Sabbath and taught his converts to do the same. Paul never taught that the divine law was no longer binding. Earlier in Romans, Paul had confessed: “The law is holy, and the commandment holy, and just, and good.” (Romans 7:12, KJV) Paul always balanced righteousness by faith with recognition that the divine law is still binding and must be kept. The context of Romans 14:5 & 6 clarifies what Paul meant about esteeming all days alike. He was referring to pagan practices. Romans 14 opens with Paul instructing the Roman believers to support new converts who were “weak in the faith” and not engage in discussions on points that would shake their newfound beliefs. Receive one who is weak in the faith, but not to disputes over doubtful things. For one believes he may eat all things, but he who is weak eats only vegetables. Let not him who eats despise him who does not eat, and let not him who does not eat judge him who eats; for Yahuwah has received him. Who are you to judge another’s servant? . . . The new converts had come out of paganism. There was a tendency among such people to still fear the power of their old idols. Many were still influenced by old superstitions. Because most of the meat in the city had been offered to idols, many of the new converts abstained from eating meat, choosing to eat only fruits, grains and vegetables instead. Paul knew well that the idols' power came from demons and Yahuwah’s power was stronger. Paul had no problem eating meat that had been offered to idols, because he knew that idols were not gods at all. Idols and the food sacrificed to them were not an issue to Paul since he had not been a participant in the ceremony of dedication. Paul was a faith warrior as well as a tender shepherd of the flock. Simply because his faith was not shaken by eating food offered to idols, he knew that others did not have his understanding. Some of the new converts in Rome were “esteeming” one day above another as a continuation of the old pagan beliefs. The pagans often went on partial fasts, abstaining from certain foods on particular days. This is similar to Roman Catholics eating fish, but not other meats on Fridays. Not only were some new converts afraid to eat food sacrificed to idols, but others were still observing the gods’ various fast days. Others regarded all days alike, giving no particular respect to one day or another by fasting. This was the issue Paul was addressing in Romans 14. He was not referring to seventh-day Sabbaths or annual feast days at all! The phrase “Let each be fully convinced in his own mind” (Romans 14:5) has been misunderstood by many people. It does not give permission to anyone to break the divine Law and choose their own day of worship. Instead, in context, Paul is saying that each one needs to be individually convicted of what is right so that he can obey the law! Paul never claimed that the law should not be kept. Rather, he is telling the Romans that each should diligently seek a full understanding of the will of Yahuwah. 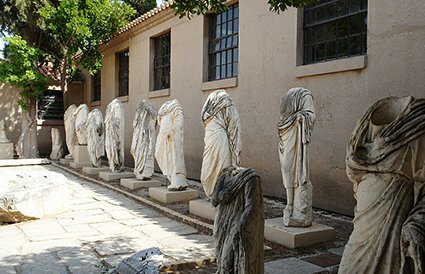 If the Romans truly were “fully persuaded” each in his own mind, there would not have been problems with some of the new converts still fearing pagan superstitions or observing pagan fast days. Paul’s admonishment was that all should protect these “babes in the faith” and not be stumbling blocks to them. In turn, those who were young in the faith had the responsibility to study the law and the will of Yahuwah so that they could each understand the divine will and live in harmony with it. Yahuwah is concerned with the smallest particulars of our lives. However, He wants us to understand we are not saved by works, either eating or fasting. His concern is the motive of the heart which prompts the action. Paul understood that only service done by love would be accepted by Yahuwah. He admonished the Roman believers to quit judging one another based on works: fasting or not fasting. The full thrust of Paul’s message was obedience to the law through faith because of love for the Father. 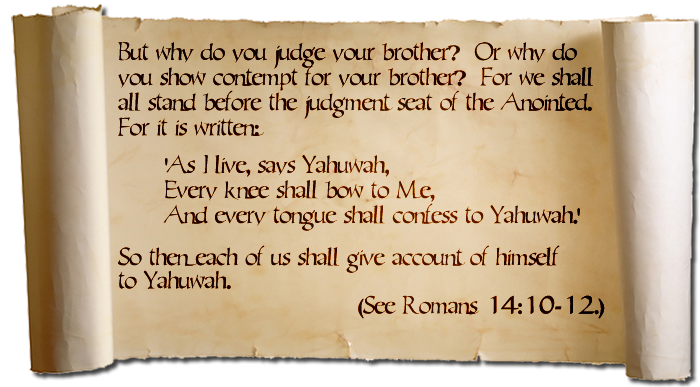 Paul cautioned the Romans against judging others, because we ourselves will also be judged by Yahuwah. Paul’s message to the Romans is as applicable today as when it was written. Let everyone protect those young in the faith, neither judging others nor being a stumbling block to them. Let everyone commit to know, to study and understand Yahuwah’s will and live his life in harmony with it. May all believers keep the divine law because they love the Law Giver.